I’ve been professionally writing about the game, film, and tech industries for six years online. If there’s one thing I’m an expert at, it’s the Internet. With a degree in 3D graphics, I have also seen, studied, and experienced every aspect of 2D and 3D animation, and am currently working on my first Droid and iPhone game. For this top 100 list I explored over one thousand current and retired blogs, forums, and communities around the Web before deciding on the final hundred that made the cut. I chose to use Alexa’s global Web traffic rankings as a guideline for the list’s structure, but I bumped some sites up or down depending on how often they update and how influential they are specifically towards animators and not just all digital artists in general. I even designated the first ten spots on the list to massively popular sites that will benefit every artist even if they’re not focused on animation or art at all. Try to not get too caught up with the rankings and instead appreciate all of them as one big Web library that can help you reach your full potential and excel in your career. Hope you enjoy! Let the bookmarking bonanza begin! 100. Amazon. Alexa Rank: 10. If you’re completely new to animation, then there are a lot of famous animation educational books that you must read. If you’re an animation veteran, then you’ve probably already read most of them, and still need to buy more paper, paint, supplies, and software. No matter where you’re at in your animation career, Amazon is a site that will always help you progress and succeed. If you happen to be one of those animation amateurs then I suggest you start with The Animator’s Survival Kit. 99. Dribbble. Alexa Rank: 1,439. Dribbble (yes, with three b’s) is still in its infancy online, yet it’s already one of the most popular sites on the entire Internet. No matter what your art industry background is you should be vying for a much desired Dribbble invite. This private online community is the Twitter for artists and what it lacks in user quantity compared to the likes of Facebook and Twitter, its makes up for it with its overwhelming amount of quality. 98. DeviantArt. Alexa Rank: 139. No, DeviantArt doesn’t have much to offer in the field of animation, but as the single largest art site on the entire Internet, there’s no denying its massive appeal and networking potential. Many of the animators out there create their own characters to animate, and DeviantArt is a great place to share your concept art, model sheets, WIPs (Work In Progress), render stills, and all of your other 2D and 3D progress. 97. YouTube. Alexa Rank: 3. 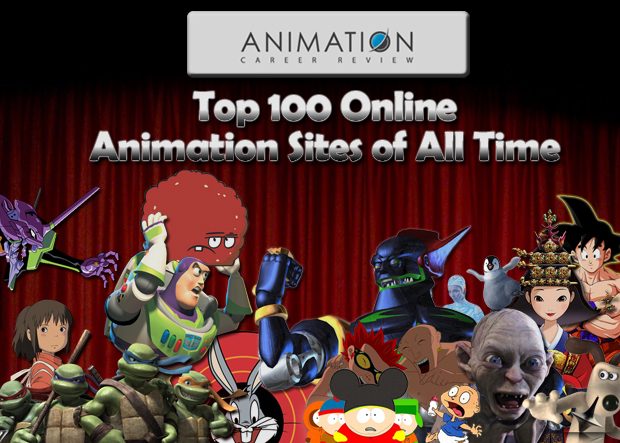 Whether you’re pursuing an animation degree or trying to learn the craft on your own, no amount of schooling or studying can compare to the millions of hours of both simple and advanced video tutorials that you can find through YouTube. For free. Find the right current user accounts and you’re in for daily uploads combined with the opportunity to ask questions and receive great feedback. 96. Facebook. Alexa Rank: 2. One of the golden rules of any business or industry is that it’s not what you know; it’s who you know. Professors and professionals alike will all agree that networking is essential to advancing your career throughout your life, and while LinkedIn is certainly worth your time, Facebook’s countless animation groups make it an invaluable asset to any animator from any country. 95. Vimeo. Alexa Rank: 122. Specifically the “Animation” category of the site, Vimeo is inarguably the more professional version of YouTube. While you won’t find a deluge of digital tutorials on it like you will with YouTube, you instead have the largest collection of famous and groundbreaking demo reels and animation reels that the Internet has to offer. Once you’ve assembled enough art and animations of your own, be sure to host all of your videos on Vimeo and then use CarbonMade to make your online portfolio! 94. ColourLovers. Alexa Rank: 3,732. Almost every modern animation is made in color, and if it’s not, ColourLovers still has a shapes section that can help you and your art team figure out exactly how a prop, character, scene, or transition should look on the screen. This site is more than just a massive help for color fashion, textures, and trends; it’s the best art theory community on the entire Web. 93. FFFFound. Alexa Rank: 4,266. The perfect site to complement ColourLovers, FFFFound is probably the best place an artist can go online to be inspired by randomness and unexpected visuals each day. If you’re ever in an art slump, you should go to FFFFound. If you’re in a drought where you feel like you’ve seen it all before, it’s time to visit FFFFound. Bored or tired? Don’t you dare procrastinate on Reddit and Twitter; FFFFound is what you need. My professional 3D artist friends also demand that I recommend Designspiration (Alexa rank of 17,313) as well. 92. cgHub. Alexa Rank: 15,637. If DeviantArt is the YouTube of online art communities, then cgHub is the Vimeo of them. Every pixel of the relatively new site’s design shouts professionalism and you can spot famous film and game industry professionals on its stylish front page gallery every week. What’s even better is that it has dedicated sections for contests and job postings for artists of all fields. It’s not as old and massive as some of the famous art communities of the Web, but it’s quickly becoming my favorite of them all. Also, even though this other site’s now offline, I feel the need to give a posthumous shout out of respect to GFXartist for being possibly the best overseas online art community of the previous decade. Even though it’s offline it stills holds the honor of having an Alexa rank of 15,695 to this day. 91. FreeSound. Alexa Rank: 16,531. Not every animation needs sound effects, but every animation should have some form of audio paired with it, and very few 2D and 3D artists in the world also specialize in music effects. Save yourself hours of making your own music and the financial hit of licensing expensive tracks. FreeSound, along with FreePlayMusic (ranked 38,948) and SoundDogs (ranked 39,793) have every animator’s audio needs.